In 1956, the now-billionaire Eli Broad was a 23-year-old with an accounting degree, living in Detroit, earning $67.40 a week. This was hardly enough to support his wife and the child they expected, so, together with carpenter Don Kaufman, he went into building homes. Broad had an idea to cut costs (offer homes without basements), but there were few reasons for optimism: Broad’s idea wasn’t original (he read about it in a magazine). Besides, the two did not have much experience in construction. They possessed no prime land, superior technology or a favorable market position. They decided to try, so they built two model homes and purchased 15 empty lots. To everyone’s surprise, the inventory was sold out in a weekend. What happened next was even more surprising: Despite the overnight success, competitors ignored the possibility of offering simpler, cheaper homes. They could have easily mimicked the concept but they didn’t. Instead, they kept doing what they always did, buying land and building posh houses. Within 12 years, the company, KB Home, became the first homebuilder to be listed on the New York Stock Exchange, eventually joining the Fortune 500 list. How did Broad and Kaufman succeed? The answer may be elusive, but success certainly wasn’t predicted by standard theory in strategic management. Current thinking ascribes success to two sources: a monopolistic position or hard-to-imitate resources. KB Home had no semblance of a monopoly and no unique resources. Yet their success may have come from another source of high performance: Strategic intelligence, the ability to anticipate competitors’ behavior and preempt it. Our research suggests that it can boost performance, even for traders in hypercompetitive markets or startups with little upfront advantage. To be sure, current theory can explain some success stories — like the ascendance of Google owing to its secret search algorithm — but it could hardly predict the rise of KB Home. Neither does it explain the success of another 20-something who, a few decades later, dreamed up a new kind of underwear. Kevin Plank, a college football player, entered the market for athletic wear in 1995, when it was dominated by giants like Nike and Adidas. Working in his grandmother’s basement, he fabricated underwear from a synthetic fiber. It was light and moisture-wicking, but the yarn was widely available, making the concept easy to imitate. Yet the initial lack of proprietary materials, technology or brand name somehow did not stop UnderArmour from growing. Competitors were slow to catch on to the idea, and Plank became the youngest entrant to the Forbes list of billionaires, growing the start-up into a multibillion-dollar behemoth. When you come to think about it, many household names — Home Depot, Walmart, McDonalds, Amazon — entered crowded markets without a clear advantage, yet somehow emerged on top. Likewise, many high-flying startups did not begin with an obvious monopoly position or inimitable resources (think Warby Parker or WeWork). Perhaps they accurately predicted that potential competitors would not respond because they were not paying attention or unable to react quickly. Such accurate predictions about competitors’ mindset are the mark of strategic intelligence. Explaining success (or failure) is easy in hindsight, but a good theory can make a prediction. If strategic intelligence can truly bring a competitive advantage, its precursors should be measurable, and its bearers should be identifiable long before they succeed. But companies and firms are complex, luck plays a role, and neatly delineating causes and effects is impossible. So, to measure strategic intelligence and assess its contribution to performance, we replaced the complexity of real-world markets with the clinical precision of behavioral experiments. To control for advantage from monopoly or unique resources, we created markets that excluded both. Instead, we designed markets where assets are identical, all information is public, and everyone can enter or exit and has equal access to resources. To make money in any market, you need to be able to acquire resources at a discount or sell them at a premium. This is exactly what “buy low, sell high” advises. But in our markets, following the adage should have been hard: Homogenous products, complete information, and many competitors created intense competition, frustrating anyone trying to turn a profit. Would strategic intelligence matter? To test our predictions, we recruited 150 individuals to trade in those markets. Traders varied in education and experience. The crowd included undergraduate students in a variety of majors, MBAs and some practicing managers. Once they arrived in the behavioral laboratory, we assessed each trader’s analytical skills and strategic intelligence. The two are very different. Most of what we study, from kindergarten to university, involves solving problems, engaging in backward induction, employing contemplative thinking, understanding math and statistics. As hard as such problems can be, they do not require strategic intelligence. Strategic intelligence is what’s needed to outsmart a cunning rival. To understand the difference, consider what it takes to predict the stock market performance vs. guessing the hand of a rival poker player. The stock market may be unpredictable, yet it is not actively trying to deceive you. A worthy opponent is doing just that. To assess strategic intelligence separately from analytic skills, we introduced the same traders to quantitative scenarios that required them to predict and outsmart rivals. The open responses were not right or wrong. Rather, they were a direct measure of how each person perceived the competition. Next, we put this measure of strategic sophistication to test. After assessing analytical skills and strategic intelligence, we randomly assigned each trader to one of our markets, letting them compete for cash profits. The markets resembled modern stock markets. Each trader received real money and stock-like financial assets, which paid dividends with known probability. Traders could calculate the true value of the assets and try to make money by buying below fair value and selling above it. But to do that, they had to find someone willing to sell on the cheap or buy dearly. With perfect information and numerous competitors, profiting was never going to be easy. But some grasped their competitors surprisingly well. For example, one trader quickly bought an asset, paying roughly true value. He immediately listed it for sale at a much higher price, found a buyer, and reaped an instant 85% return. Then, he ventured further. With the proceedings from the sale, he bought another asset, this time overpaying about a quarter above fair value. Again, he immediately attempted to sell it, asking for triple the price. Yet he found a buyer and pocketed a 200% profit. He also epitomized strategic intelligence: He accurately grasped that some traders were naïve, so it made sense to buy an over-priced asset because he foresaw flipping it at an even higher price. Contrast this with what can be expected from a trader with decent analytic skills — but lower strategic intelligence. She could have calculated that the asset was overpriced and simply avoided it, reasoning that overpriced assets are a poor investment. In another session, we documented how a trader posted a low offer and managed to get someone to sell an asset about 20% below true value. In the next period, he quickly resold the asset, managing to get a price well above fair value. And who was the buyer? The same person who sold the asset at a cheap price to begin with. To recommend “buy low, sell high,” is easy, but grasping that the same person may sell you low and buy high from you takes keen insight into others’ behavior — strategic intelligence. When trading ended, we systematically compared each trader’s analytical skills and strategic intelligence, measured before trading, with their eventual earnings. A clear pattern emerged: Despite intense competition, some traders took home much more than others. Comparing traders with similar analytic skills, we found that strategic intelligence was a strong predictor of earnings. For instance, those with average analytic skills and below-average strategic intelligence earned 25% below average. But traders with identical analytic skills but above-average strategic intelligence scored 25% above average — a 50% difference in performance. 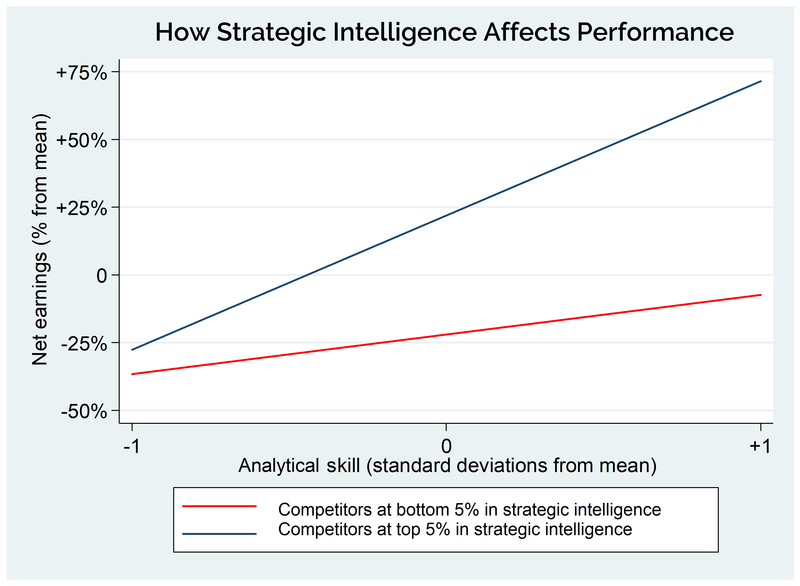 And strategic intelligence made all the difference among top performers: Those with good analytical skills and excellent strategic intelligence performed about 75% better than those with equally good analytical skills but poor strategic intelligence. Strategic intelligence allowed some traders to earn healthy profits in a hypercompetitive market. It predicted performance just as well as any of the analytic skills we measured. This was remarkable given how much weight our educational system places on analytic skills, and how little time we spend teaching strategic intelligence. “Know the enemy and know yourself” advised Sun Tzu, the ancient warrior. Our research confirms that some people excel in outsmarting the competition — and they can be spotted in advance. One of them must be Eli Broad: While running KB Home, he recognized an opportunity in another market. He was quick to jump from homebuilding to financial services, turning a small insurance company into a retirement behemoth, and becoming the first person to have founded two Fortune 500 companies. Fascinating article. I’ve long thought that there was some kind of identifiable, perhaps even quantifiable, “X factor”, beyond merely excellent execution, that enables companies like you’ve mentioned here to succeed in already well-established, mature markets and industries. It seems you may have discovered at least a part of that secret sauce. I’m interested to learn more about how strategic intelligence can be learned and continually developed. Also, I think the poker comparison is relevant in this context, but I feel obliged to point out that many entrepreneurs, like me, are terrible poker players. Why? I’m much too much of an optimist and don’t “know when to fold ’em”. Or rather, I do—I just don’t usually accept it.